Great tasting. Family seasoning mix. Slow cooker friendly. No added MSG. No artificial colours or preservatives. Suitable for vegetarians. 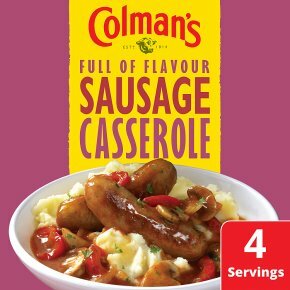 This packet of Colman's Sausage Casserole seasoning mix helps you create tasty, hearty meals for the whole family to enjoy. Containing a carefully selected blend of herbs and spices, it has never been easier to serve up 'meals that say it all'. Now Slow Cooker Friendly too! Follow the easy instructions on the sachet for melt-in-the-mouth tenderness.